I opened my hive the other day to check on things -removing my last super, and to button everything up for the winter. When I took off the inner cover, I noticed some small black beetles scurrying around on the top bars of the hive and my heart sank. 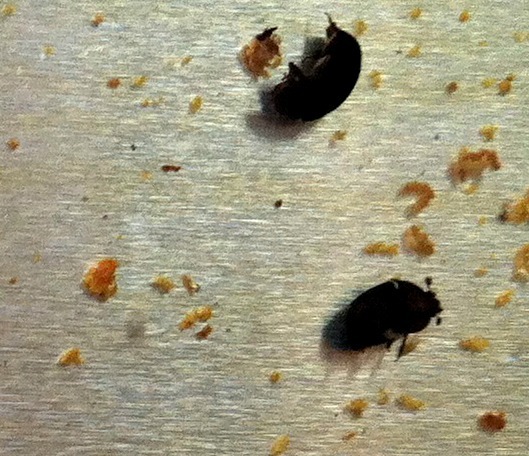 I knew right away that these were the dreaded ‘hive beetles’ that I had heard about but never had to deal with. Honeybees get a lot of pests, and I thought that I had dodged the bullet on this, because I have never seen them in more than 10 years of beekeeping. But even though I had never seen one, I knew exactly what it was when I saw them dart around the top bars of the combs. How could something so tiny be so destructive? And be in my one hive that was doing do well? Hive beetles, Aethina tumida, are opportunistic creatures and will seek out weak hives. They fly into the entrance of a hive and lay eggs in the comb. The larvae hatches and feeds on pollen and honey stored within the hive. 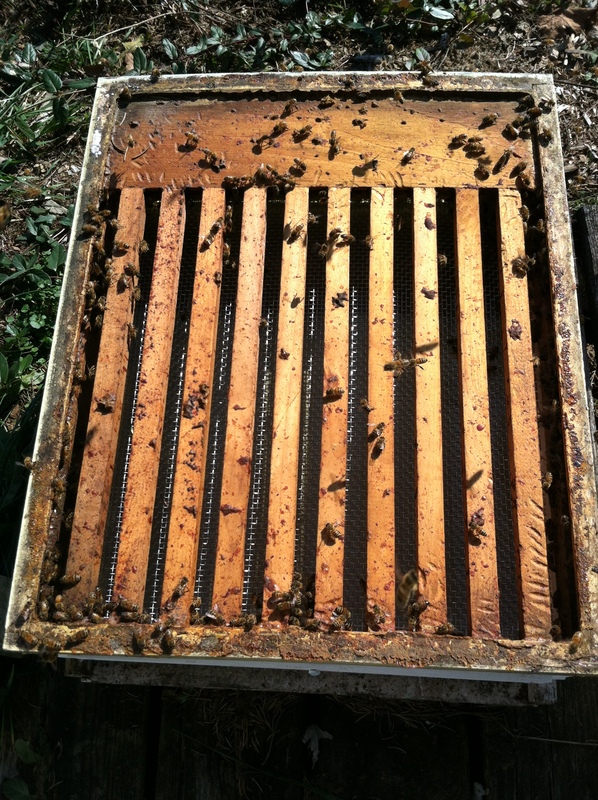 When feeding on the honey and pollen, they can leave a slimy mess of honey that can ferment and ruin the honey. Yuck!! I didn’t want those %!!*)!!!! beetles in my hive. 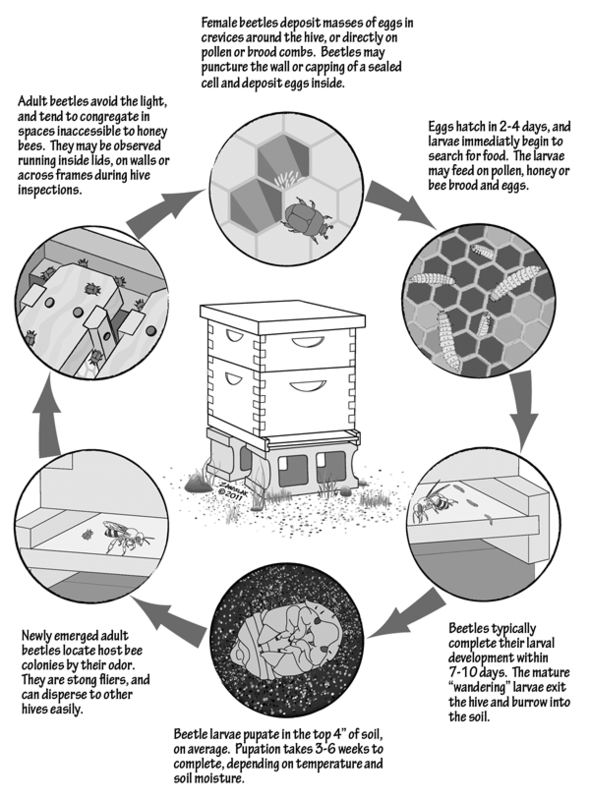 The larvae exit the hive and enter the ground to pupate for 3 to 6 weeks, emerge from soil as an adult, and can fly 5 to 12 miles in search of a hive to invade. A severe infestation can cause an entire hive to leave and find better conditions, so I was quite worried. And I saw at least a half-dozen of those darn beetles darting around, so I had to do something before they became too numerous for the honeybees to take care of. I wanted to use non-chemical means so I found a ‘trap’ from http://greenbeehives.com that is basically a bottom woodenware drawer that you fill with vegetable oil. You place the drawer under the slotted rack (if you have one), at the base of the entire hive and the beetles fall and drown in the oil. Yea!!!! 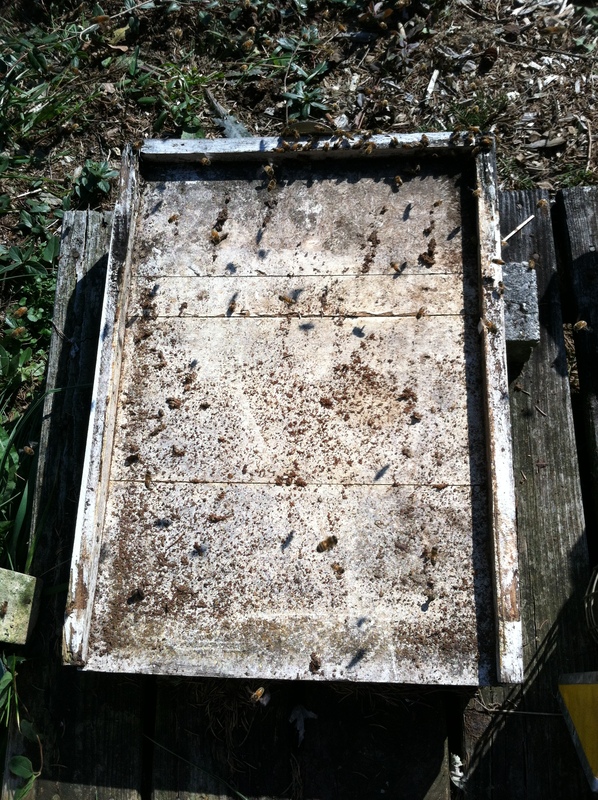 First I tore apart the hive down to the bottom board. Here was my opportunity to scrape all the debris off and clean it. Then I removed my screened bottom and put the new ‘drawer’ with oil in its place. 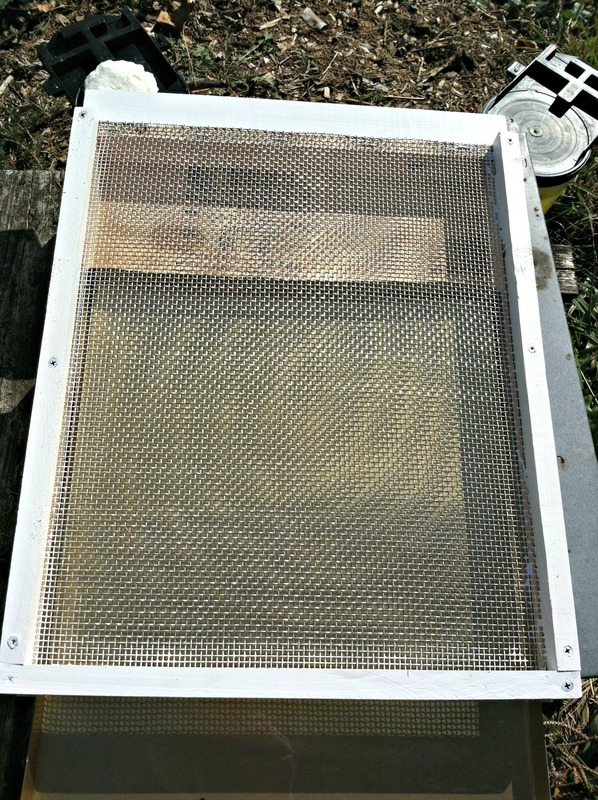 Then I placed the slotted screen on top to maintain good circulation throughout the hive. Then I placed both hive bodies on top and the inner and outer cover to put it all together again. The idea is that the beetles in their travels through the hive will fall, especially when the honeybees chase them. Normally, they would fall to the bottom and come back up to the combs and start wreaking more havoc. But with the oil at the bottom, they become stuck and drown. If water was used in place of oil, the water would freeze in cold weather, so oil is the best option. The next day, I pulled open the drawer and voila, there were at least a dozen very dead hive beetles floating in the oil. Hooray!!! It works!! Females lay 4000 eggs a month for 2 months! The beetles have developed the ability to stimulate the mouth parts of worker bees with their antennae, similar to drones begging for food and able to trick bees into feeding them! Wow, how do you deal with a pest like that? The honeybees cannot sting them – they are unable to penetrate their hard shell. So, they chase them and the beetles hide in cracks and crevices in the hive. 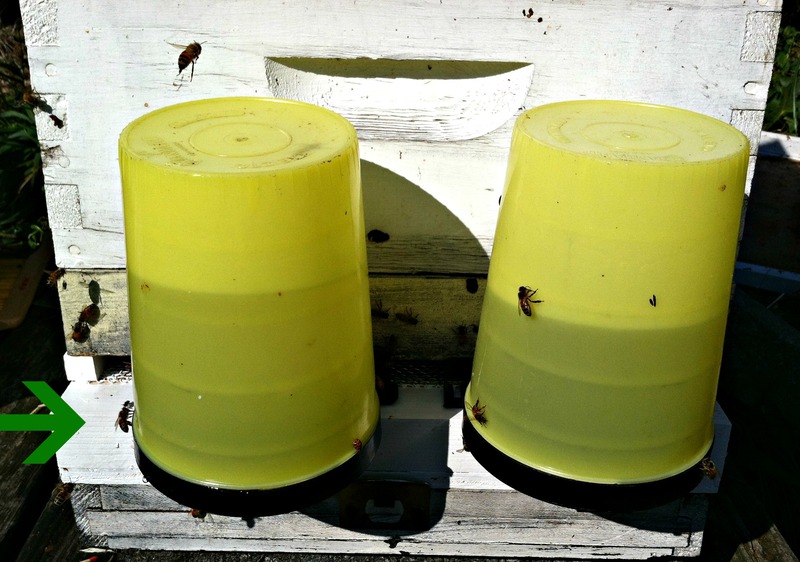 Honeybees are able to contend with fairly large populations of hive beetles, but there is a tipping point where they become too numerous and can be a huge problem, and that is why I was worried. I wanted to nip the problem in the bud and would recommend this method of the oil to anyone. It was easy and safe, rather than resorting to chemical controls. The poor bees have so much to contend with I hope the oil keeps the hive free of the beetles. Oh no 🙁 Urgh, hope you can keep them at bay with this method. I feel so grateful we don’t have them in the UK yet, varroa is bad enough. I agree! But it seems like these bad things have a way of moving around and will be everywhere eventually. We’ve a beetle trap here in Australia with the delightful name of ‘Die Ya Bastards!’. Works with diatomaceous earth to mess up the beetles pores (although not as well for me as a bottom board trap). The main thing though is the sheer accuracy of the sentiment when you find them in your hive. I agree! I say that every time I check the trap. I feel like celebrating!